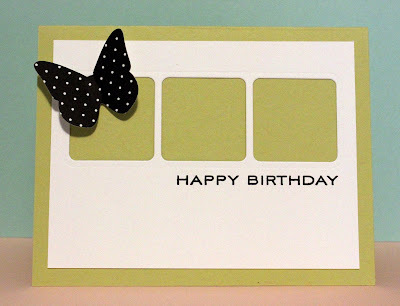 I am back for another quick post for a challenge happening over at Papertrey. This time, it is a sketch challenge. Nicole gave us several sketches to choose from and here is what I chose. I used Papetrey's dies (take three and butterfly dreams), spring moss cardstock, Birthday Basics stamp and black patterned paper. I have to work with very limited supplies today since I left most of my crafting tools at the Crop and Create venue. Good that I have some cut outs left lying on my crafting table. Have a great Sunday. I'm off to day 2 of the Crop and Create event. Bebsy should be here soon! Soo cute! Love the sketch as well!! This is very cute. Love the simplicity of it. Seeing all of your card designs is an inspiration. I really need to try more cards and I know just where to come for some ideas :). We are 4 friends who share a passion for crafting and creating anything handmade.